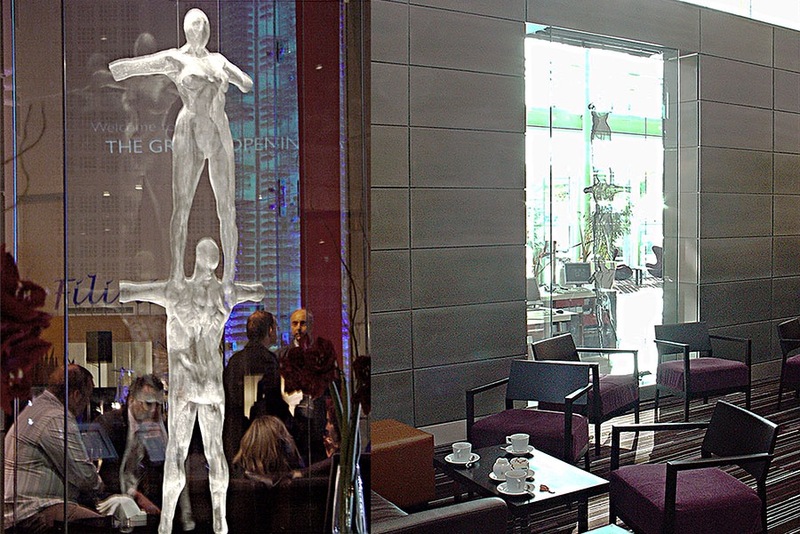 Hotel commission for reception area: Steel-mesh sculpture of two acrobatic figures, suspended within in a glass case. The artwork can be viewed from both sides which reveals the multi-facetted nature of the piece and of the medium. The fibre optic lighting highlights the form of the sculpture giving it an ethereal appearance. The piece fits perfectly with the hotel’s different and refreshing approach to accommodating the public. Hotel Radisson is already known for its outstanding luxury and customer service. The hotel has the first wine tower in Europe, which is 13 metres tall and houses 4,000 bottles of wine. It is an impressive centrepiece adorning the 19 metre tall atrium which in itself is something of a masterpiece, completely open plan and with hotel rooms looking out upon the various restaurants and cafes, it creates a particular ambience in which to relax and enjoy the hotel.